You want to be established in the faith? You should. you will get all riches of the full assurance of understanding in due time. To help you grow in the faith, pastor Martin Richling teaches the bible verse-by-verse at The Scriptures Alone Bible School: 'Where the Holy Scriptures are Taught Aright'. These lessons are free. This school is for the faithful believer. 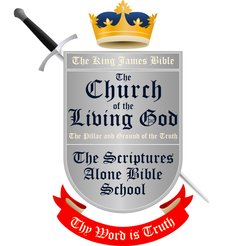 So, if you love truth, you can join The Scriptures Alone Bible School. If you want to join the school, you must contact pastor Martin Richling directly.